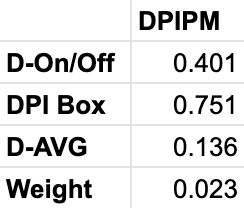 Player Impact Plus-Minus (PIPM for short) is a plus-minus impact metric that combines luck-adjusted plus-minus data with the value of the boxscore and a handful of interaction terms to estimate a player’s value over the course of a season. The goal of any good metric is not just to measure what a player has done, but to be able to predict how they will perform in the future. This is where older metrics, like PER and Win Shares, struggle to maintain relevance. Statistical plus-minus metrics, such as the popular Box Plus-Minus, which only use box-score information improve in this regard, but can struggle mightily on the defensive end. Newer plus-minus metrics, such as Real Plus-Minus, Regularized Adjusted Plus-Minus and player-tracking metrics, such as Player Tracking Plus-Minus, are the current benchmarks for publicly available metrics. They both can describe what a player has done and are predictive of future results. The main feature of PIPM that differentiates it from other more advanced metrics is the inclusion of luck-adjusted plus-minus data, which uses a methodology designed by Nathan Walker. In short, his methodology uses more statistically predictive factors of a team’s offensive and defensive rating (points scored or allowed per 100 possessions) to estimate what the team’s ORTG or DRTG should be without the variance that some statistics have. 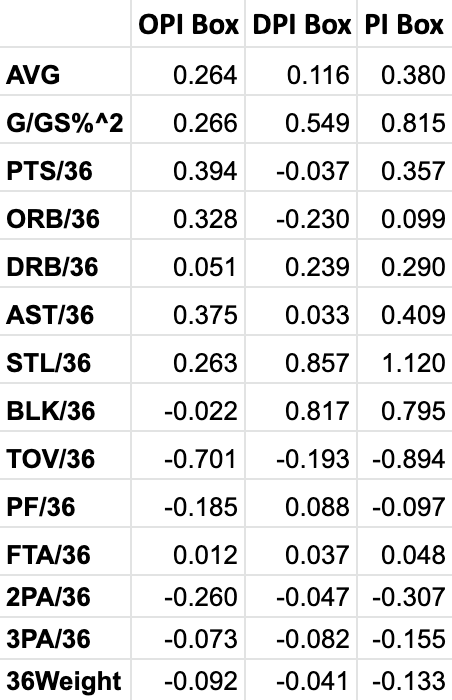 The most clear example of this variance comes from opponent 3P%, which a team has relatively limited control over but can drastically shift how a team looks in raw ORTG and DRTG. 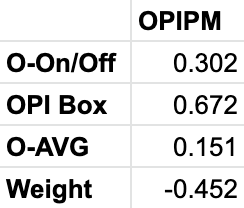 Using these luck-adjusted plus-minus values as an input, along with the boxscore, PIPM is one of the most accurate publicly available impact metrics in terms of predicting future results. For seasons prior to 1997-98, the first in which plus-minus data is available league-wide, an estimate of on-off data is calculated using simple interaction terms. This simple interaction adds a great deal of accuracy for earlier seasons without the typical downfall of statistics interacting outside of the training set of data in ways they were not intended to. The final portion of Player Impact Plus-Minus is converting the per 100 possession estimates of value into a cumulative Wins Added based off playing time. This is done using a typical Pythagorean wins estimate with an exponent of 13.98. Replacement level for the league is set at a PIPM of approximately -2.3, below average but in basketball there are often below average players on the court who still help their teams more than hurt. A complete historical database of PIPM can be found here. Thought it was about time I updated the publicly released coefficients. You would have been able to find them through the public sheets if you knew how, but for the purpose of maximum transparency here they are in one easy place. AVG is the team’s overall ORTG, DRTG or Net RTG minus league average and multiplied by a player’s percent minutes played.